After my first NaNoWriMo win in 2010 the following two years I did write, but not the whole 50,000 words. But hurrah 2013 has seen me winning again. At just over 50,000 I think I’ve nearly completed my first draft (just a couple of scenes still to write). What I’m most impressed about though was, this year, I wrote nearly every day (until I ‘won’ and then I crashed and have done nothing since – oops). Huge congrats go to all my NaNo buddies who won or wrote anything – great job guys. For those of you who would like to know a little more about my novel Tetrana – here’s the link to the extract on the NaNoWriMo website and here’s my Pinterest inspirations board (I really want some of those clothes!). Now I need to edit up to a fuller novel count, so any advice on how to do this without the extra words merely becoming padding would be gratefully received. 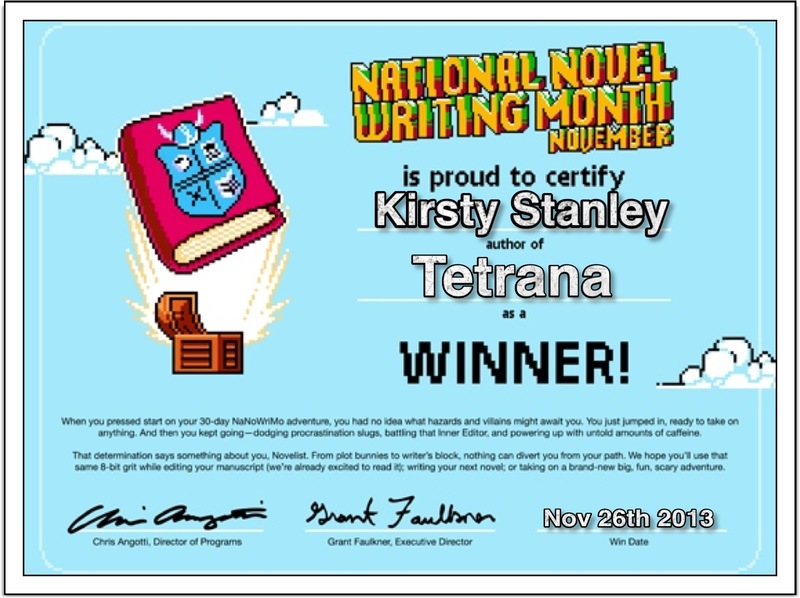 Posted on December 1, 2013, in #am writing (and all things writing related), Tetrana (WIP) and tagged NaNoWriMo, Tetrana, Winner. Bookmark the permalink. 6 Comments.